Jim Wells in the Nolan Show studio with Sarah Ewart and her mum Jane. 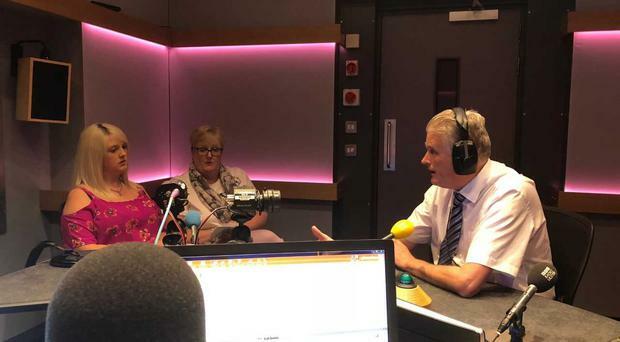 An abortion row erupted on the BBC Radio's Ulster's Nolan show on Monday morning as Jim Wells said the DUP could use the petition of concern to block abortion rights in Northern Ireland. Mr Nolan had DUP MLA Jim Wells on the show for a discussion following the repealing of the Eighth Amendment to the Irish Constitution on Saturday. Also on the show was Sarah Ewart who was forced to travel to England to have an abortion after she was told her baby could not survive outside the womb. Mr Wells has recently had the party whip withdrawn following his recent criticism of the DUP leadership. The host asked veteran politician Mr Wells if the law should be changed to allow easier access to abortions in Northern Ireland. Cabinet ministers and Tory backbenchers have joined the Labour Party in calling on the government to extend abortion rights to Northern Ireland. A rally in support of lifting the almost total ban on abortion here will be held outside Belfast City Hall at 5pm on Monday. After their landslide victory in the Republic, pro-choice activists have pledged to now focus their attention on this side of the border. On Thursday, around 20 women will openly break the law by driving a bus around Northern Ireland distributing abortion pills. Some activists will swallow tablets in defiance of what they call "archaic legislation". DUP leader Arlene Foster said the referendum will have no impact on Northern Irish law and Mr Wells echoed her comments. "The view of the party is that this is best left to the Assembly," he said. He said that issue had been debated in the Assembly in 2016 and no changes were made and that he was confident the same would occur again. The DUP can block any new legislation on abortion with a petition of concern that requires at least 40% support from national and unionist parties to be approved. Mrs Ewart said she had a meeting to discuss the issue with Mr Wells when he was serving as Health Minister and that she left the meeting "very upset." "This is medical care. We need help with our consultants at our home with our family around it," Mrs Ewart said. "If it's good enough to send us away, why can't we have it here?" Mr Wells said that he genuinely believed the people of Northern Ireland believed that the lives of the unborn were worth protecting. "I accept there are a small number of very, very difficult cases which require compassion and support." Mr Wells said that when abortion had been introduced in countries it led to it becoming more widely available. "I'm only here to talk about fatal foetal abnormalities," Mrs Ewart replied. "Don't judge me into you've walked in my shoes." Mr Wells said that while he sympathised with Mrs Ewart, but that evidence had shown that allowing abortion in any form opens the floodgates. He said that experts can get it wrong when diagnosing fatal foetal abnormalities. Mr Wells said that 6,000 people listening to the Nolan Show would not be alive today if abortion on demand had been introduced in Northern Ireland. 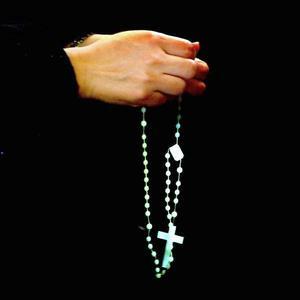 "This is not about abortion on demand, it's about healthcare," Mrs Ewart said. "There is a massive difference being sent to one of these clinics between people wanting to lose their baby and people losing a baby they very much wanted. "It shouldn't be happening. It is devastating and way more traumatic than it ever should be.